Hi Hayden , after looking thru lessons on ‘Fly Me To The Moon’ that starts with a 6-2-5-1 Are we to view the ( Gm/C7/Fm/Bb7 ) in ‘Autumn Leaves’ as a 6-2-5-1 also ? Cause I’m trying to work out some licks for that part. Should I just look at it as a 2-5-1 & add some lick over the vi chord before the 2-5-1 or is there a more theoretically beneficial way to make licks over this progression ? i.e I see you have an Ebmaj7 after the Bb7 on the 2nd last bar of the ‘Chord Changes’ lead sheet. So we could make it a 2-5-1 in Eb7 .After that I got a bit confused . I have a (DIY) lick over the progression( Gm/C7/Fm/Bb7 ) but it’s a bit ‘clunky’. dominant is not a major chord so your lick should not contain the Major 7 . Autumn Leaves is a nice tune to apply material you have transcribed over 251 progressions. Most of the form is 251s, and so you have lots of opportunity to apply your new material. Firstly, it’s worth noting that the tune is also commonly played in E Minor so it’s a good idea to learn it in that key as well as G Minor. You can use iRealPro to quickly transpose, or even better, work it out yourself. Next, most of the form is ‘bouncing’ between a 251 in Bb Major, and a 251 in G Minor. Bb Major and G Minor are relative major/minor keys. The Ebmaj7 is just use to connect the major 251 (C-7 / F7 / Bb7) and the minor 251 (A-7b5 / D7b9 / G-7). For me, that is all of the info I need to remember the form, and understand where the harmony is moving. after looking thru lessons on ‘Fly Me To The Moon’ that starts with a 6-2-5-1 Are we to view the ( Gm/C7/Fm/Bb7 ) in ‘Autumn Leaves’ as a 6-2-5-1 also ? No, I would just look at that as a cadence moving to Eb Major, which then takes us to the 251 in G Minor to end the tune. I’m trying to work out some licks for that part. Should I just look at it as a 2-5-1 & add some lick over the vi chord before the 2-5-1 or is there a more theoretically beneficial way to make licks over this progression ? Here’s an idea for you which I think is nice and simple to apply. Firstly, there are many different ways to play the C Section. If we look at iRealPro, we can see that those 2 bars contain different chords and we no longer have the Ebmaj7 on the last line. Instead the whole of the last line is a 251 in G Minor. I find this works great at faster tempos. It’s easy to remember and also simple to execute with left hand voicings as in the audio file above. I’m just playing a G- triad with my left hand and then dropping the bottom note down by half steps. Yes it can be confusing because we will find a lot of different changes for the C Section of Autumn Leaves depending on the source. When playing the tune as a ballad I like the G-7 / C7 / F-7 / Bb7 / Ebmaj7 changes. But at faster tempos I like to simplify it as outlined above. Check out chapters 2 and 3 of this lesson on “Alone Together” where we cover some minor blues scale material using G Minor Blues and D Minor Blues. The concepts we focus on are target notes, approach patterns & chromaticism. Understanding these principles adds structure to your improvised lines. 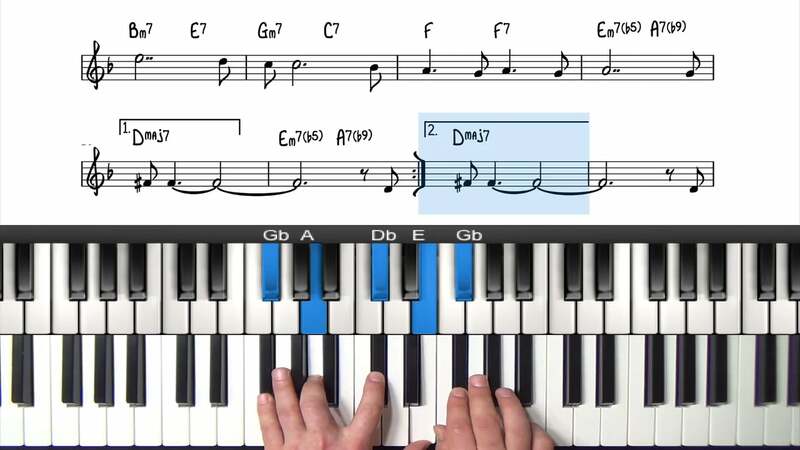 We cover some other improvisation concepts in that lesson which you may also find useful so check out the whole lesson. This tutorial introduces the 'locked hands' technique. 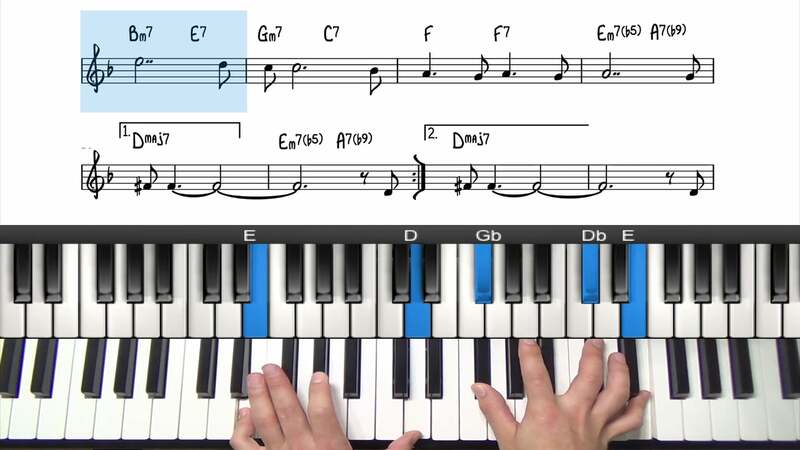 This style involves playing left hand voicings simultaneously with an improvised line. ‘Locked Hands’ Technique sounds great with Autumn Leaves! Hope this helps Niall and have fun applying this stuff. Thanks Pierre & Hayden. I appreciate all the advice. Sorry for late reply I’m having to use internet cafe’s at the moment to check email & take notes & print off info from here. I’m going to work thru all this info & hopefully get clearer understanding. Thanks for everything, It means a lot to me.